On the Friday afternoon before the away game against Albirex Nigata I was sitting enjoying a coffee and trying to improve my poor Japanese by studying Kanji in the Starbucks in Lumine in Omiya, when I saw a group of the lads arriving to get some refreshments for the journey to Nigata. Rafael and Carlinho were among them and everyone looked positive. I wasn't lucky enough to go to the game. In fact I have to admit that I have never seen Omiya play away yet. Well, it is good to leave plenty of things needing to be done in the future. Something to look forward to. Both Albirex Nigata and Omiya Ardija's home shirts are Orange so Ardija played in their white away shirts and hence the title of this post. If anyone went to Albirex, I'd love to hear about your day. 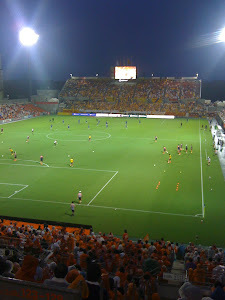 Certainly I am sure that if you went to Nigata's stadium to follow the Orange of the Squirrels from Omiya, then you would have had a long but great day out as Omiya ended up taking this battle of two orange teams 2-1. Nigata started the brightest with a goal after 20 minutes from Bruno Lopes, but Ardija fought back in the second half to equalize through Kikuchi on 68 minutes and that man Rafael on 83 minutes. Rafael has his critics and even I wondered if he was fully fit for the first game of the season, but you can never right him off. He has the strength and the ability to score against all the J League defenses on his day. So Omiya came away from Nigata with a valuable 3 points which put along side their good performance in the first game, even if it ended in a home loss, this is something to build on in the next coming weeks. Well done to the Squirrels! Let's go Omiya!